You will not believe how easy baked chicken recipe is! A simple mixture of flour and spices is used to coat chicken pieces. The chicken is then baked and tastes like you spent hours frying it. Anyone else LOVE bone in chicken thighs? They are a staple in our dinner meal plan because they are cheap and easy. 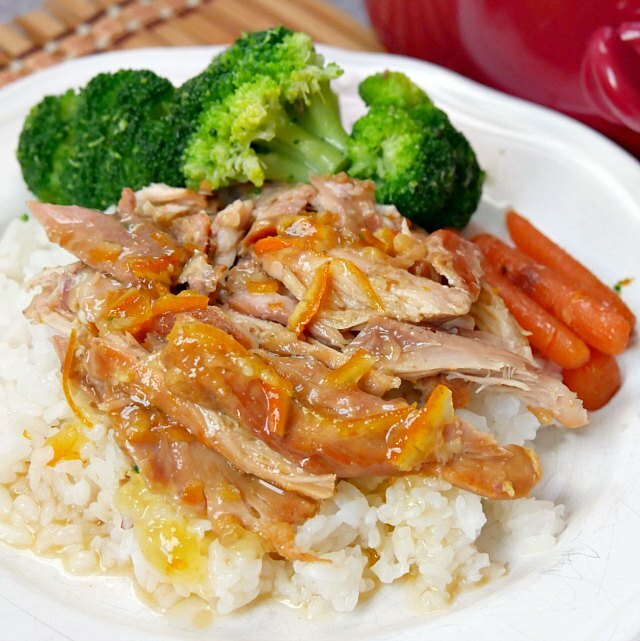 They are great in the slow cooker (like in Slow Cooker Orange Chicken). 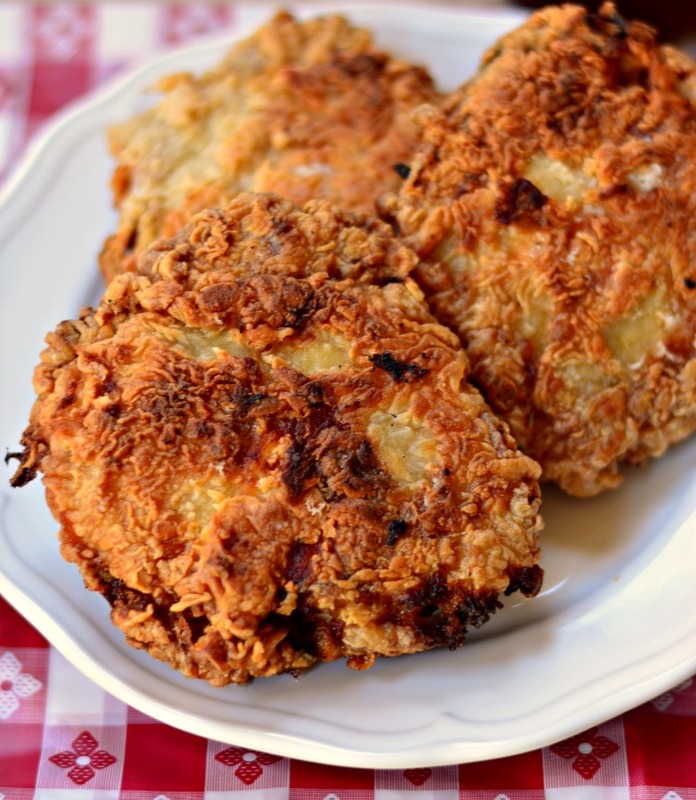 They also fry up well (like in our Sweet Tea Fried Chicken Recipe). 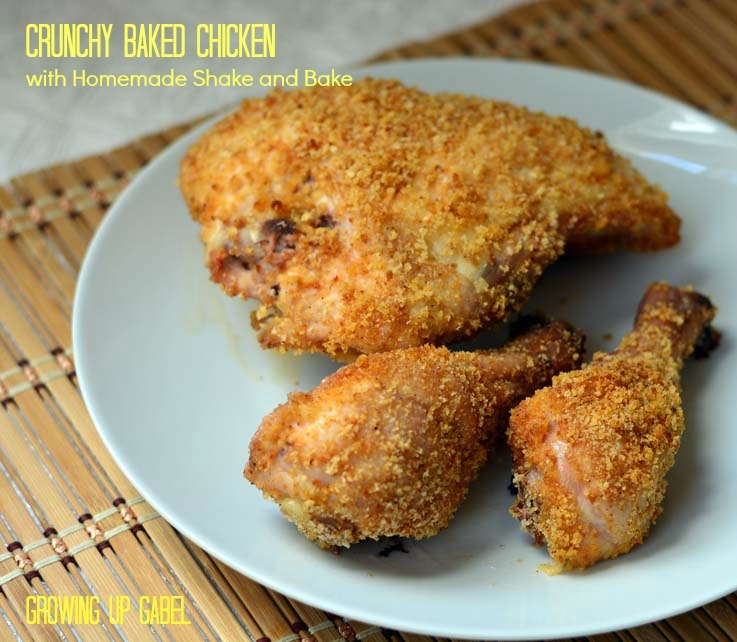 And you can bake them using a homemade shake and bake or using this delicious baked chicken recipe, which makes baked chicken taste fried. If you don't love bone in chicken thighs, this recipe will work with pretty much any cut of chicken. You can make it gluten free by substituting coconut flour for the wheat flour. The recipe calls for 3 pounds of chicken. That is enough to feed a family of four so if you want leftovers, make more chicken. Baking the chicken on a rimmed baking sheet, or jelly roll pan keeps the air moving around the chicken to make it crispy. But feel free to use any type of baking dish. 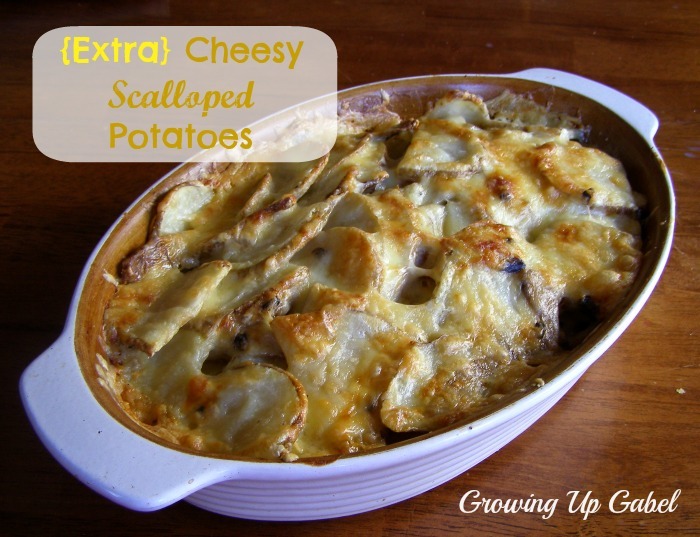 I like to serve this chicken with more traditional side dishes like these easy scalloped potatoes. You can cook the potatoes in the same oven as the chicken or cook them in a slow cooker. 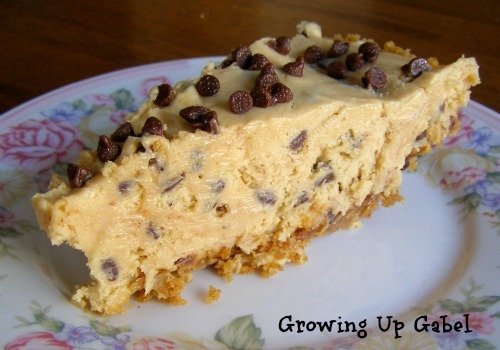 For dessert, the chicken goes well with a little peanut butter chocolate chip pie. Love home cooking? Check out this fun Amish cookbook! Grease a jelly roll pan or other baking dish. In a medium bowl combine flour and spices. Whisk well. Dredge chicken in flour mixture and then place in baking dish, skin side down. Bake at 375 degrees for 45-60 minutes or until chicken is cooked through. Flip chicken once, half-way through cooking. Thanks SOOOO much for your recipe. It’s my daughter’s favorite form of chicken, now. I’d been planning on making traditional fried chicken tonight, and she was bummed that I wasn’t doing your amish baked chicken instead, so I’m compromising: Used your seasoning blend (to which I usually add JUST a bare smidge of cayenne and about 1/8 tsp chili powder, and go halfsies on regular paprika with the other half being smoked spanish paprika), marinated the chicken over-night in buttermilk, then rolled in your flour-seasoning-blend, fried to brown in a skillet, then placed on the greased baking sheet to finish cooking in the oven. I’m getting a bit more of a traditional fried chicken crumb this way, without the continued time in the deep oil. Also, I have found that I can do a bone-in-skin-on chicken breast for myself, start it 20 minutes before the thighs, then treat everything else the same, as I’m a “white meat” kinda person. Thanks again for sharing this recipe with us! Love it! I agree a touch of cayenne gives a wonderful flavor. And smoked Hungarian paprika is amazing! I may try the buttermilk soak even before baking. I bet it’s delicious! I have this in the oven as we speak. I am so excited about this chicken. 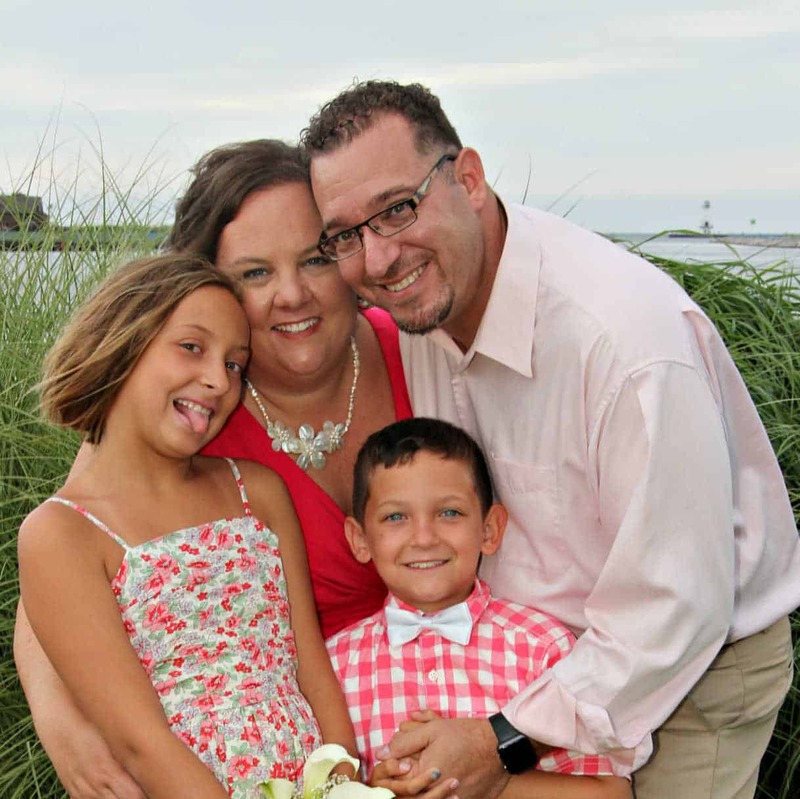 I am a working mom of 5 and needed a easy dinner to throw together using bonein chicken thighs. So happy I found this one. Thank you! Used recipe but not directions…instead combined 1/3 cup butter and 2 tbs. veggie oil to rimmed baking sheet and stuck into preheated oven to melt butter. While melting mixed the coating and placed in plastic bag. Once melted dipped chicken pieces into melted butter combo then shook in bag. Placed back onto baking sheet and baked for about 40 minutes (thighs and legs) They were amazing and the skin stayed on perfectly. Great flavor! Sounds delicious! I love your alterations. Thank you for sharing your wonderful recipes. I plan to serve the Amish Baked Chicken the next time I have family over for dinner. There was an earlier comment regarding grease spatter in the oven. How much spatter occurs seems to depend on how fatty the chicken pieces are, but you can reduce the amount that messes up the oven by using a higher-sided baking dish, instead of a jelly-roll pan or cookie sheet. That’s a good idea. I’ve never had any issues with spatter with this recipe so I always use a jelly roll pan. Thks for the recipe; I’m always on the lookout for baked versions of fried fav’s. My son loves fried chicken, however artery clogging food just isn’t my idea of feeding my family well. I’m going to give this recipe a go this week! I made this with chicken breast and coconut flour, it was amazing. Then a little mushroom garlic sauce over quinoa with it. So so good! With coconut flour! Cool! Now I’m going to have to try that. Thanks so much for stopping by to share your variation. I love it! The only problem with making this with boneless thighs is you eat too much because it is so good & easy to eat because you don’t have to work around the bone!! Delish!! A keeper! I was excited about making this and made it this evening for dinner.. I made an oven baked fried chicken before and the flavor was great and texture was just like fried chicken.. how ever this recipe on a scale 1-5 I’d have to give it a 2 and that is because it was baked not fried if I went on flavor and texture I would of gave it a 1..
I’m sorry to hear that Cheryl! I’ve make it all the time and sometimes the skin doesn’t get as crisp as I like. I’m not sure if that’s the chicken or what. But it’s always a delicious meal! Really excited to try this recipe! I don’t bake much so this may be a dumb question but it doesn’t say to bake the chicken covered and I’m assuming you don’t, so wouldn’t grease end up spattering and making a mess in the oven? I’m thinking if I did cover it, it probably wouldn’t come out crispy though. You are correct – don’t cover it! We want it to get nice and crispy. It pops and sizzles a bit but doesn’t make a huge mess or create any issues! When you say to “dredge”, do you mean to just coat it in the flour mixture? Or to coat it in the flour mixture, then an egg/milk mixture? I made this with boneless skinless chicken tenders, and it looked kinda dry from the flour mixture coating, but tasted delicious! We dabbed some olive oil on to make it look more appealing for the kids. Didn’t look at all like your picture, but it also didn’t have skin. I’m glad you liked it, Alex! Any advice for preparing this recipe in large amounts? I would like to make it for my daughter’s graduation party but would need to make it the night before. Has anyone ever cooked and reheated using this recipe? I would be using foil pans and sternos for keeping it hot. I would love any thoughts or suggestions. Thank you. It’s like making fried chicken – you can make it ahead of time, but it’s not quite as good reheated. But I think it would still work. I would reheat in the oven to get them crispy just know they won’t be quite as crisp as they are on the first day. Good luck! This look delicious and am excited to try it tonight! I had a question about cooking times with boneless and skinless thighs… how long and same temp? Probably a little less time but same temp. Just keep checking them to make sure they don’t dry out. Enjoy! Just wanted to let you know that I make this chicken at least once a month and that everyone I have ever served it to LOVES it! By far the best Baked Chicken I have ever eaten! Thanks so much for sharing. I blogged about the recipe and gave you credit (of course). Thanks again! I look forward to trying more of your recipes! This looks so good. I’ll give this one a try. Thank you. Lost count of the number of times I’ve made this. Thanks for sharing. Thanks for the recipe! I’m looking forward to making this tomorrow evening. I’ll be using boneless chicken breasts and baking for 20-25 minutes. I ordered Market Day years ago! No one seems to use it here in Vegas, though. Enjoy! I think Market Day is only located in the Midwest and a handful of states in the South and East. I am so looking forward to tonight’s dinner…Amish chicken, cheesy mashed Yukon gold potatoes, and Italian green beans. Thanks again! I don’t think so. Just check the potatoes when you flip the chicken to see how they are doing! I’m going to try this tonight but with chicken legs. Hopefully it turns out good because it sounds amazing. Yay! Thanks for letting us know! I made this last night and it was so easy and so good. I used boneless, skinless chicken thighs and it was fantastic. This is definitely a keeper! Yea! 🙂 I haven’t made it with boneless skinless thighs, yet. Glad it worked! This recipe looks wonderful. I was wondering, are the chicken thighs you use bone in? Do they have skin? Yes, I generally use bone in, skin on chicken thighs. A friend of mine uses boneless, skinless breasts though and says it turns out great! I’ve also used bone in, skin on chicken breasts and they are yummy, too! I have now added this to our regular menu rotation. So much healthier than fried chicken, but it has the exact same crispiness in the skin. The only thing I could do with a little bit less of is the garlic powder, but only because I think the garlic is the overpowering flavor in the recipe. However, I’ll probably still leave it exactly as is, and just make sure I have an after-dinner mint ready 🙂 Love the recipe and thanks for sharing…makes having “fried” chicken a whole lot easier (and safer)!! Glad to hear it! Yeah, I really, really love garlic so I put it in everything! 🙂 We have a lot of mints handy. Yea! One of our favorite recipes! Thanks for stopping by. Hi Nancy! Thank you for your comment. Actually, a fellow blogger did some research on this recipe. It’s called “Amish” chicken because the chickens that were used to make the dish originally were purchased from an Amish farm. To further clarify, I have a BA in religion from Hillsdale College (with honors). I took a semester long course on Anabaptism, which includes the Amish religion. I actually traveled to Goshen University, a Mennonite college, to do research for my term paper for that class. I have several friends from Mennonite backgrounds, which is basically a step more liberal from the Amish. I asked several of them about this recipe, who also asked their relatives, and none of them had heard of the recipe. There are definite Amish traditional foods that have been passed down through generations, but this is apparently not one of them. That’s why I said I had no idea what was “Amish” about the recipe. I hope you understand, now, that I do not write glibly. 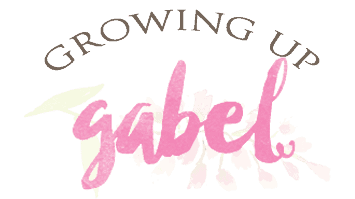 One of my friends who is from a Mennonite background will be guest posting this Fall – I hope you stop by to check out some of her recipes! Again, thanks for visiting! After reading my post, I feel that I was a little harsh. Most of the recipes labeled “Amish” are called that by people who eat their cooking and thereby call it Amish. The Amish themselves would not label it such as that would be prideful. Found this on Pinterest. It’s what’s for dinner tonight!! So excited for a new chicken recipe!! Hope your family loved it! I found this on Pinterest and have made it 4 times now. Thanks for this great recipe! Yea! I think I could have this once a week! 🙂 Thanks for stopping by! This sounds brilliant! I’m going to add this to the menu for next week. I am deathly afraid of frying things in oil, so this is perfect for me! Yeah, I’ll fry if I have to but the mess and the smell make me avoid it if I can! Enjoy! Can you use skinless, boneless chicken breast with the Amish Chicken recipe? Absolutely! I’ve never done it but a friend of mine has and she said it was delicious. Great! Will be making this today! Aw, man, we had leftover ribs! 🙂 Now I want chicken. Let me know how they turned out! Turned out Great! My chicken/crust wanted to stick and I sprayed my pan good. Any suggestions? I plan on making it again today. I usually make mine on my Pampered Chef large baking stoneware pan and it hasn’t stuck yet. Maybe try aluminum foil over the pan and spray that? I also don’t use cooking sprays. When I grease something, I generally use butter – it seems to help with any residual sticking. Hope that helps! I do use aluminum foil but will grease using butter. Thanks for the tip! Good idea on using the plastic bag to put the coating on! Glad it was a hit with your family. And thank you for taking the time to let me know! We made this tonight and loved it!! Yea! I think I could eat this once a week. I never knew this was Amish Chicken, this is exactly how I make my chicken. Don’t get me wrong I Love fried Chicken but it’s much healthier baked so that is how I been making my chicken for several years now.. Love it!! Saved this recipe I can’t wait to try it! I made this recipe tonight and the family loved it. Next time I make it I will end with BBQ sauce. Thanks for the post. Thanks for letting me know! I have a super picky eater who won’t do sauce, but I bet the BBQ would taste great on it. I just made this chicken for dinner today. It was really delicious: moist, juicy and tasted great! And so simple to make :-). Thank you for the recipe! sounds good, can’t wait to try it………. break your thighs first, they will get done better. Wow this looks so good and so easy, for sure pinning and trying! I was waiting to comment until I tried this. And I made it tonight. YUM! I have a go to crispy baked chicken recipe that I like, but you pour melted butter over top. 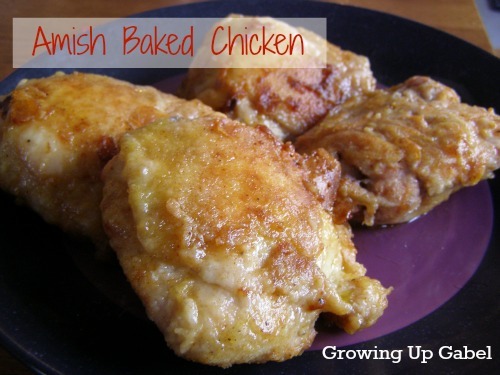 I think this will now replace it as my go to baked chicken recipe! You are right, so easy and crisy. Thanks for sharing this! This recipe has more hits than any other post! 🙂 I’m glad you liked it. It’s definitely getting a permanent spot in the menu rotation. I’m so glad you posted this. I was curious about it when I saw it on your menu plan. I look forward to trying it for myself! Let me know how you like it! It’s one of those recipes that I just couldn’t believe how good and yet how easy it was to make — always a bonus!